The Garden of Earthy Treasures believes in food sourced as locally as possible and in season. That shouldn’t mean that you forgo certain luxuries such as avocado. Had bought one years ago before I got into what I’m doing now, it got frosted and died, I gave up after someone told me they won’t grow below Sydney. Recently I heard someone was growing a banana in Horsham, 35 km south of me, and the thought of an avocado popped back into my mind, I know the Boss would love homegrown avocados! Did some reading and came across the method below. It has worked once, as you can see, and now I’m successful once again. See that little green stem arising from the center of the seed? (Don’t mind the cobweb, did’t notice it when I took the pic). The secret is, as far as I can tell, is to keep the base in water and do not let it dry out!!! When topping up the water do not let the top get wet, it has to dry out, crack open and then shoot. Water at the base and keep the room temperature between 18 and 27 deg C. The constant temperature assists in drying out the seed so it will germinate. I cheated because I have a terradome to use but if you leave it on the window ledge of the kitchen, for example, the heat radiated into the room during the day will be negated by the cool air flowing down the same window at night. This leads to the next secret that is they do not need light to sprout. Therefore to maintain a constant temp you can cover the seed and bottle with a clear plastic drink bottle (top chopped off and turned upside down over it) to create a little micro climate enabling the constant temp and humidity. A tip on the tooth picks! Make sure you can see the seam that runs bottom to top on the seed. I peeled the lower seed to show it up. This line is where the crack forms to let the shoot through. If you put in the pick on that line one of two things will happen. Better to leave the seed on the bench top to dry so the thin light brown skin cracks showing you where the germination line is (middle seed in the pic). Avocado on the right with some frost damaged leaves snipped off around the base. New shoots are growing so fast you can almost see it! 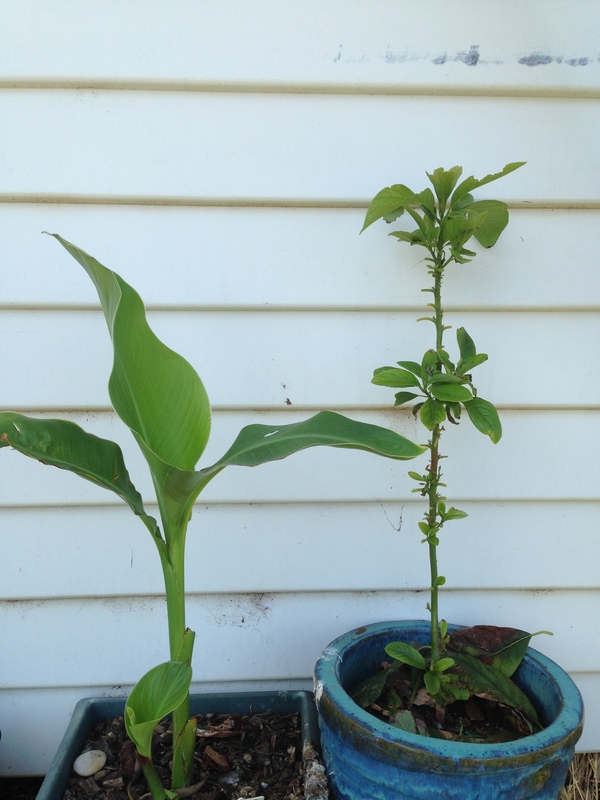 Canna on the left has a new shoot too. Another experiment in growing stuff here that we shouldn’t be growing. Both were protected by a plastic tree guard and stakes over the winter and placed on the north wall which has full sun in winter and shade in summer, fertilised and mulched now for the growing season. Will monitor how they both do and next spring I plan to graft onto the avocado both Bacon, Tonnage and maybe if I can locate one a Anaheim!!! 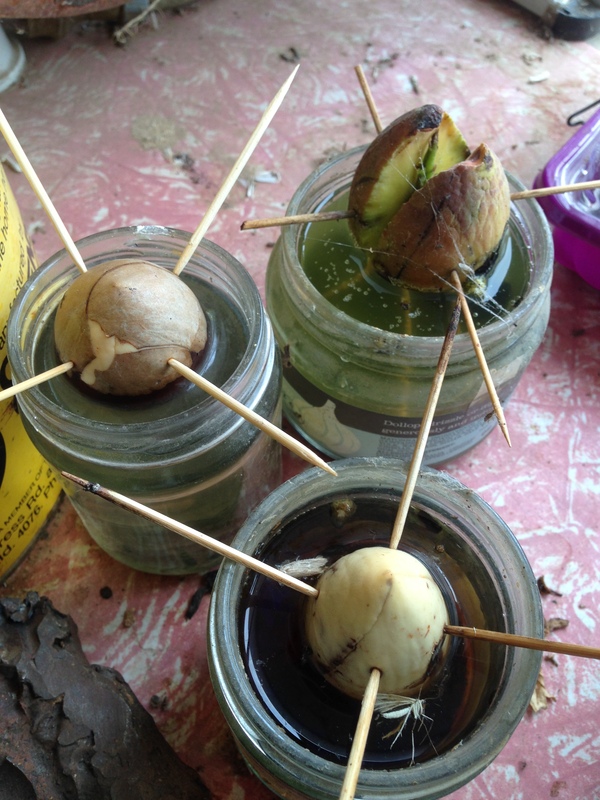 This entry was posted in Aquaponics for everyone, Updates and tagged Avocado, seed.